Something you have never tasted before! It's cold brew coffee that's been infused with nitrogen gas. 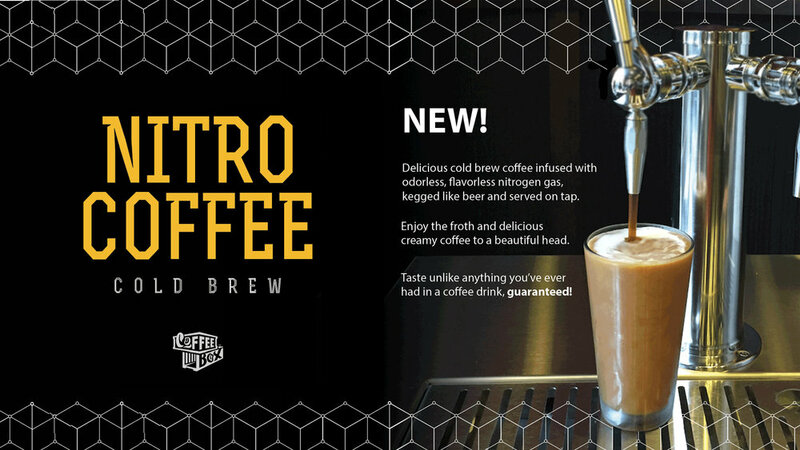 Coffee lovers say that nitro coffee is creamier and richer than straight up iced coffee. Some say it also tastes sweeter than your average cold brew. First, our system infuses nitrogen into our specialty grade coffee. As it comes out of the tap, the amber-colored coffee cascades down the side of the glass. The tiny bubbles rising to the top are actually the nitrogen bursting out of the Cold Brew. Nitro coffee really impacts the mouthfeel. It provides a real creaminess to it that you don’t normally get. Once the nitrogen has fully cascaded out, it’s not too dissimilar from regular Cold Brew. But you do have that dense, creamy head. A lot of people compare the look and texture of Nitro Cold Brew to a Guinness stout.